A few weeks ago I covered some trigonometry classes for another teacher. They were studying polar and parametric graphs and the common curves limaçon, rose curves, cardioids, etc. I got to thinking about these curves. the next few posts will discuss what I learned. To help me see what was happening I made a Winplot animation. My “Roulette Generator” (RG) is a rather simple setup and turned out to be very well suited to study a variety of curves: cardioids, epicycloids, epitrochoids, hypochoids, and hypotrochoids to name a few. They are all examples of roulettes – curves generated by a point on a curve as it moves around anther curve. I considered only cases where both curves are circles. Calculus will make it appearance after the first few posts in this series. I hope you will find information here that will let you make a good project or investigation for calculus or precalculus students. The RG can be set to graph any number of situations as I will discuss. So here goes. Roulettes – 1: Equations and the Roulette Generator. In this post I will discuss the derivation of the parametric equations used to make the animations and some notes on how to use the RG. Later posts will discuss some of the various curves that result. I began with a simple cardioid. A cardioid is defined as the locus of a point on a circle as it rolls without slipping around another circle with the same radius. 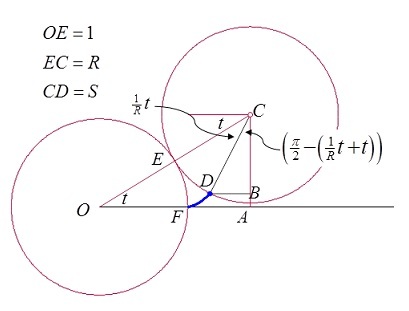 The equation of the locus: In the figure above, the locus of the point marked D, as the moving circle rolls counterclockwise around the fixed circle, will be the path of the curves. A small portion of the curve is shown in blue running from F to D. In our investigations we will eventually want to place the moving point inside, on, or outside the moving circle. To do this we will use S as the distance from the center of the moving circle to the point we are watching. For the moment and for the simple cardioid, we will assume they are the same: . The ratio of the radius of the fixed circle to the radius of the moving circle is 1/R, and will be of interest. The ratio can be adjusted by changing R. We can, therefore, keep the fixed circle’s radius constant and equal to one. You may enter these equations on any graphing calculator by entering specific values of R and S. You will have to re-type them for each different curve. With the RG you can make the changes easily with sliders. The roulette generators: I used Winplot a free graphing program I’ve used for years. Here are the links so you can download Winplot or Winplot for Macs. the Winplot file containing the generator is here: Winplot Roulette Generator. [Sorry, this is no longer available here and WordPress will not accept Winplot files for download. Please contact me at lnmcmullin@aol.com and I’ll send you a copy.] The Winplot equations are discussed here: Notes on the Roulette Generator. A Geometer’s Sketchpad version may be downloaded Geometer’s Sketchpad Roulette Generator. You will need Geometer’s Sketchpad to run this on a computer or the “Sketch Explorer” app for iPads and other tablets. A big ‘Thanks” to Audrey Weeks who was kind enough to make this for us. Audrey is the author of the Algebra in Motion and Calculus in Motion software. Audrey is my “go to” person when I have math questions. Other graphers with sliders such as Geogebra and TI-Nspire will probably work as well. For those who wish to adapt this to some other graphing program there are some syntax consideration to making the one circle roll around the other and showing the path as the circle rolls. If you make your own generator on one of these other platforms, please send it along and I’ll post it and give you credit. Experiment with the R and S sliders. In the next several posts well will do this and learn about various other curves.